The National Film Archive of India, the country’s largest film archive and custodian of the Indian film heritage, is conducting a workshop in film preservation and restoration to help conserve the nation’s cinematic legacy. The NFAI, in collaboration with the International Federation of Film Archives (FIAF) and the Film Heritage Foundation (FHF), will conduct a one-of-a-kind 10-day workshop beginning February 26 titled ‘Film preservation & restoration workshop India 2016’. The objective of this programme is not only to augment the infrastructure and capacity of the NFAI but also to build an indigenous resource of film archivists and restorers who can work towards saving India’s cinematic heritage. “There is no culture of ‘preserving’ in this country. The first week-long workshop held in Mumbai in the Films’ Division last year was a resounding success. 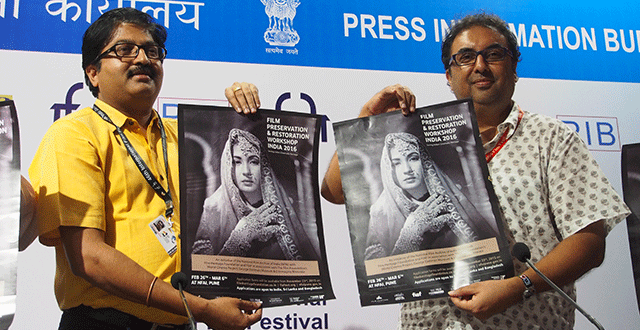 Fortunately, the fact that film preservation is a specialised field and that we need to build an indigenous resource of trained archivists that can take this movement forward is a fact that is gradually impressing itself,” said Shivendra Singh Dungarpur, who heads the FHF, commenting on the genesis of the workshop. The ten-day advanced course has been specially designed by David Walsh, head of the FIAF Technical Commission, with focus on intensive practical training in current film preservation and archival practices. “Since Indian cinema has been gaining attention of researchers and scholars across the world, it becomes imperative that these aspects along with meta-data management be made ready as per universal standards,” Mr. Dungarpur said. The workshop will be an advanced course with emphasis on documentation, cataloguing, projection system and the importance of preserving films in celluloid and digital. Lectures and practical sessions in the workshop will be conducted by leading archivists and restorers from preeminent film institutions in the world such as the George Eastman Museum, Selznick School of Film Preservation, FIAF and L’Immagine Ritrovata, and is supported by Martin Scorsese’s ‘The Film Foundation’s World Cinema Project’. There will be equal emphasis on preservation of heritage on celluloid format along with digitisation, said NFAI Director Prakash Magdum. “Even though India is one of the largest producers of movies in the world, general awareness about film preservation is abysmal and is not looked as a career option. So, through this workshop, we will showcase the use of the latest technological advances that will prolong the life of celluloid film,” Mr Magdum said. The NFAI in recent years has carried out digitisation of nearly 500 films and the restoration of 300 more a few years back.